He got everything right except the result. The impact of new manager Kenny Jackett was instant. He spoke beforehand of the importance of fans shunned by the previous regime, he acknowledged supporters as they gave him a warm and heartfelt reception as he emerged from the tunnel for the first time at New York Stadium. He dared to go with the 4-4-2 formation people had been calling for, he upped the workrate, he saw his team create chances, he tightened the leakiest defence in the Football League. All this after one full day in the job. Reading ruined it with the only goal of the game just four minutes from time. Damn you, Paul McShane and your close-range volley for depriving Rotherham of the draw they deserved. There was disappointment at the end but this was one of those rare days where other things were more important than the result. This felt like the start of a new era, this felt like things were now moving in the right direction. A slim, immaculate figure in his autumn overcoat, Jackett patrolled the technical area, an animated, engaged figure shouting out encouragement and instructions from the first whistle to the last. The last incumbent gave the impression he wasn’t comfortable being there. The new man looked like it was where he belonged. Somewhere between a towering Richard Wood header in the 56th minute and Danny Ward racing through on goal in the 58th only to miss the game’s best chance, it all came flooding back. The Millers were on top, giving everything, Reading were creaking, it looked like a goal was coming, New York was boiling. “Come on you Reds” reverberated round the ground. It was deafening. The loudest this season. Like it was during the Neil Warnock survival miracle, like it was during the Steve Evans promotion years. Ah, this is what watching Rotherham United can be like. The possession was Reading’s, the best chances were Rotherham’s. In a bright opening for the home side, when their set-pieces wreaked havoc in the visitors’ box, Joe Newell’s curler was pushed for a corner by the excellent Ali Al-Habsi, Jon Taylor cut inside and shot wide, Greg Halford had a header blocked and Wood and Dexter Blackstock combined but couldn’t force the ball home. The Millers tore into the Royals after the restart. Woods’ header brought the save of the day from Al-Habsi and Ward, during a 10-minute spell when he was almost unplayable, burst on to Lee Frecklington’s pass only for Al-Habsi to intervene again. The Rotherham striker should have scored. His next shot was heading in, but Yann Kermogant got in a superb block, and, a minute later, on the hour mark, Reading were awarded a penalty for a Dael Fry trip on Joey Van Den Berg. Lee Camp was down quickly to his right, deflecting Garath McCleary’s spot-kick away with this legs. The Royals, despite all their passing, had been restricted to mainly half-chances, but now they were dominant. Kermogant volleyed just wide from Roy Beerens’ 69th-minute cross, Millers old boy John Swift swept across the edge of the penalty area and rattled the bar 10 minutes later and in the 86th minute McShane was on hand at the back post to fire home the winner. Two minutes from the end, Ward’s clever ball released Anthony Forde on the left and the Rotherham substitute was through on goal. Winger v keeper for the victory or the draw. This was Al-Habsi’s day almost as much as it was Jackett’s. The new boss said he picked the side after consulting with fitness coach Paul Warne and goalkeeping coach Andy Dibble and the trio opted for as much experience as possible, with Wood, left-back Joe Mattock and striker Dexter Blackstock all starting. That meant a place only on the bench for loan teenager Izzy Brown, Rotherham’s greatest attacking danger in his first few matches but less of a threat in recent games. Wood, champing at the bit for a chance since August, did everything you’d expect from the type of centre-half who doesn’t know how to give less than his all, clattering into tackles, smashing through opponents in the air and giving away the odd foul when his enthusiasm got the better of his feet and he couldn’t keep them to his self. He added much-needed physical presence at the back, battled though cramp in the last half hour and was named Rotherham’s man of the match. 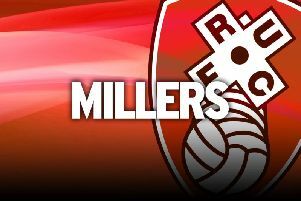 Defeat meant a seventh straight loss for the Millers for the first time since the 1961/62 season and they are eight points adrift of safety at the foot of the Championship table. Kenny is canny and knows full well the size of the task he has inherited. But, with 32 league matches left, he has time, as well as all Millers, on his side. He also knows that that famed Rotherham spirit is part of the way forward. “It’s early days,” he said. “The players don’t know me, but it is clear from today what I want and what I feel is a strength of Rotherham and something we can capitalise on. His first game brought no points, but offered something unquantifiable by one scoreline, something which had drained away during a run of one win in 14 games before his arrival.